Let me introduce you to your next favourite Central European city: Kraków, Poland. Since the fall of communism, Poland’s become a traveller’s dream. Historical Polish towns and cities await around every corner of the country, but none demands your attention more than Kraków, the former royal capital of Poland. For culture lovers Kraków is magical: Its architecture and museums will inspire you, its food will fill you, and, most of all, the hospitality of its people will warm you. Nearly every traveller’s first day in Kraków starts in Rynek Główny (Main Market Square), the heart of Old Town Kraków. However you choose to arrange your schedule, you’ll end up back at Rynek Główny—whether by design or inadvertently. Start the day off grabbing your morning coffee buzz at one of the many cafés overlooking this massive square. For people watching, this is Kraków’s switchboard. Take your time and enjoy watching Kraków’s early morning crew dodge pigeons as they wander across the square. See that massive hall on Rynek Głowny? That’s Sukiennice (Cloth Hall), a marketplace that’s been rockin’ out mad bargains since the 15th century. Test out your haggling skills (yes, you can still do that outside of the Middle East!) to snag some cool Polish souvenirs for your loved ones back home. Above the “Grand Bazaar” vibe of the lower Cloth Hall sits the Sukiennice Museum, the world’s biggest 19th-century Polish art exhibit. While it might not rival the Louvre, if you have a passing interest in art—or Polish history—you might enjoy a quick browse for minimal 2zł ($0.64) fee. Two other major Krakow attractions are worth your time in Rynek Główny: St. Mary’s Basilica and Town Hall Tower. Even if you’re “all churched out,” the impressive interior of St. Mary’s Basilica is well worth the 10zł ($3.19) fee, especially to get a chance to see Veit Stoss’ stunning Gothic Altar. Visiting Krakow in high season? Grab a St. Mary’s Basilica Skip-the-Line Ticket or the Krakow City Card to get access to up to 40 museums and unlimited rides on public transportation for two or three days! Aside from the tower at St. Mary’s, those with a hankering for heights will also love ascending up Town Hall Tower to catch bird’s eye views of Kraków. And at 7zł ($2.23), it’s not exactly a budget killer. Krakow Old Town Private Highlights: Learn more about Old Town as your walk the Royal Route from Rynek Glowny to Wawel Hill on this three-hour private walking tour. 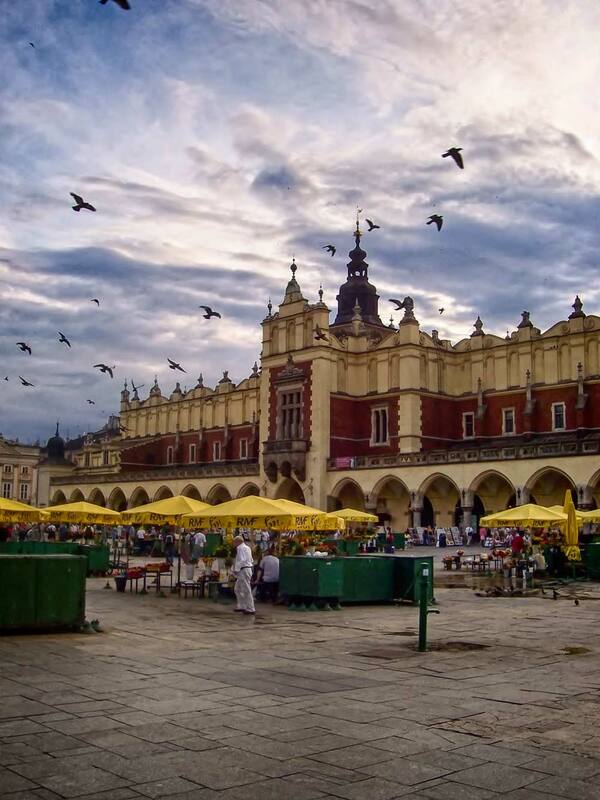 Krakow City Tour: A 4-hour tour combining bus rides and walking to get a sweeping view of the city centre. 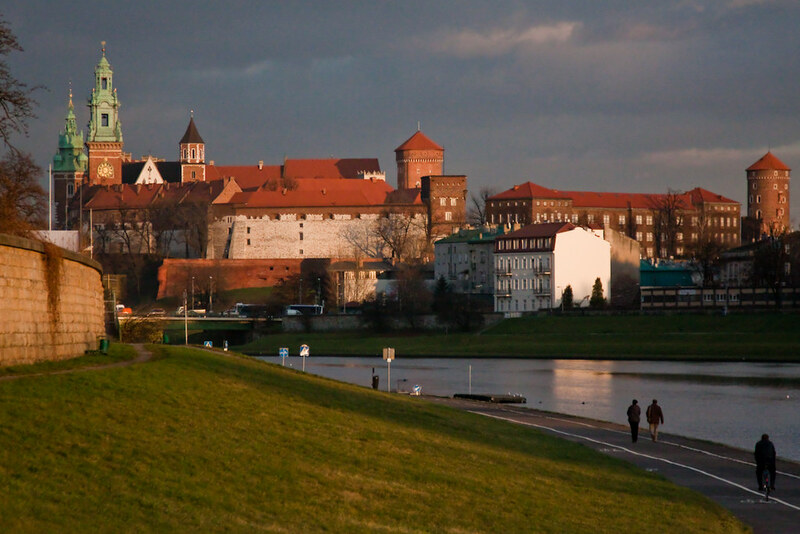 The tour price includes admission to the Wawel Castle & Royal Cathedral as well as St. Mary’s Basilica. Creepy Krakow Walking Tour: Fascinated by ghost stories? Then this 2-hour evening tour exploring Krakow’s dark side is for you! Visits sites like St. Mary’s Basilica, The Cloth Hall, and Town Hall Tower. Half of the fun of Kraków is throwing your plans out the window and simply wandering. And there’s no better place to do it than Old Town. (Even if visiting during the Polish tourism high season means you won’t exactly be alone). Culture vultures could spend a lifetime randomly uncovering Old Town Kraków’s innumerable charms. Whether it’s hunting down architectural genius in medieval squares or drenching yourself in Polish culture at Kraków’s best museums such as the Historical Museum of the City of Krakow or National Museum in Krakow, boredom is impossible in Old Town Krakow. Of all of the amazing moments I experienced in Kraków none was more memorable than eating a traditional lunch at Restauracja Kuchnia u Babci Maliny. There’s absolutely zero chance I would have ever found this place on my own, but thanks to a friendly local, we snaked through the courtyard of the Polska Akademia Umiejętności at ulica Sławkowska 17 into a dark basement full of simple wooden dining tables to eat what may have been one of the most filling meals I’d eaten for such little money. Krakow Old Town Private Highlights: A walking tour spinning around the entire Old Town area including top Krakow attractions like Main Market Square, St. Mary’s Basilica, Planty Park, and Wawel Hill. Wawel Castle and Old Town Guided Tour: An excellent value small-group tour that takes in all the best of Old Town. Tour also includes skip-the-line tickets for Wawel Castle! Krakow Introductory Walking Tour: A fantastic walking tour that hits all the bases to make your one day in Krakow a gem. Includes all of the highlights of Old Town as well as a walk through the former Jewish Quarter of Kazimierz. After exploring Old Town, hop a couple blocks south and dazzle at the crown jewels of Wawel Hill, home to the most coveted cultural attractions in Kraków: Wawel Royal Castle and Wawel Cathedral. An entire day—and a big chunk of your daily travel budget—could magically float away perusing the innumerable treasures you’ll discover in Poland’s former royal home. The exhibits on Wawel Hill each command their own price, but if you have to choose, try the Royal Tombs in the Wawel Cathedral (12zł) and the Crown Treasury in Wawel Royal Castle (18zł in high season). Mondays can be hit or miss with opening times, so plan accordingly. Once you’re done exploring Wawel Hill, introduce yourself to Wawel Dragon, a badass (literally) fire-breathing dragon immortalized in bronze in front of his former mythical lair below the northwestern side of the castle walls. Watch your eyebrows! Wawel Castle and Old Town Guided Tour: A small-group tour combining admission to Wawel Castle with a guided walk around Old Town. Krakow City Tour: A combo bus and walking tour that’s super convenient for hitting up all of the tip sites in Krakow. Includes skip-the-line tickets for Wawel Castle & Cathedral and St. Mary’s. Wawel Castle Private Tour: Avoid the crowds on this private guided tour of Wawel Hill that includes entrance fees and tickets to one of the castle’s permanent exhibitions. Not long ago Kazimierz, Kraków’s historic Jewish quarter, was a no-go zone. Outsiders rarely came, and the odd one that wound up here, would have discovered a dismal place far removed from the ageless beauty of Old Town. Today, things are different. Kazimierz is on the rise and the district that once scared off all but the bravest souls now attracts them; it’s quickly becoming Kraków’s new hipster hangout and one of the coolest things to do in Krakow! Start your tour of Kazimierz on ulica Szeroka, the former main drag of Jewish Kraków. Ulica Szeroka is one of Kraków’s most distinctive streets, lined with restaurants and bars and anchored with two major synagogues—Remuh Synagogue and the Old Synagogue—and the Remuh Jewish Cemetery. If you’re hungry you could grab a bite at one of the restaurants on ulica Szeroka or wiggle through the alleys of Kazimierz to Restauracja Starka (ul. Jozefa 14) for a taste of traditional Polish cuisine. When evening slides in, finish off your day by rehydrating with a refreshing piwo at one of Kazimierz’s many pubs. Popular Polish beers include Żywiec, Okocim and Tyskie, but to for a better idea of what Poland’s been brewing up lately retire to Omerta Pub, home of Krakow’s best selection of Polish craft beers. Kazimierz Food Tasting Tour: Explore the unique culinary delights of Kazimierz on this 3.5-hour food tour. Includes a taste test of 14 to 15 Polish dishes along with two local craft beers and two Polish vodkas. Craft Beer Tasting Tour: Get on board with Krakow’s burgeoning craft beer scene on this awesome 3-hour drink tour. Includes 10 samples at 3 of the city’s coolest brew pubs. Krakow Cycling Tour: See even more of Krakow in one day on this 4-hour guided bike tour of Old Town and Kazimierz, stopping at 25 different sites along the way. 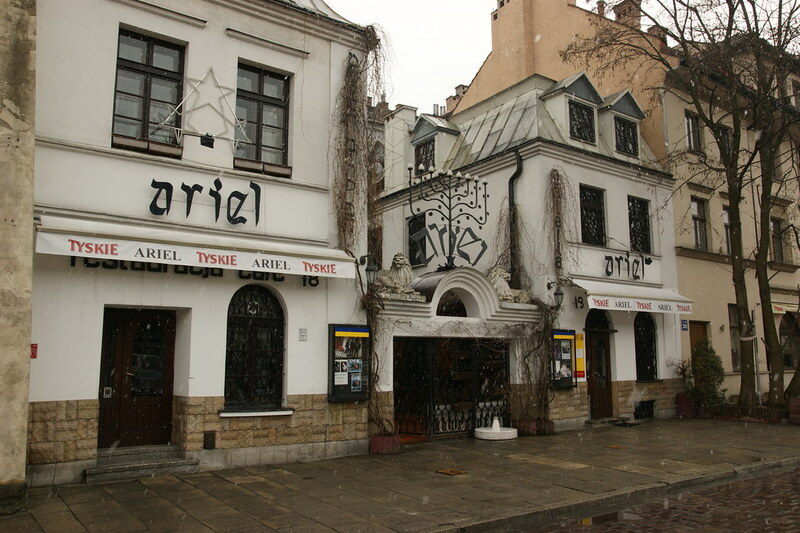 Jewish Quarter and Schindler’s List Tour: A 3-hour guided walking tour focusing on the Jewish Quarter of Kazimierz. Includes admission to the infamous Oskar Schindler’s Factory in the former WWII ghetto of Podgorze. Even with the size of the city, figuring out where to stay in Krakow is hardly as difficult as in other Central European cities like Berlin or Prague. And if you’re only spending one day in Krakow, the answer is even simpler. Aparthotel Stare Miasto: A great choice in Old Town Krakow. Rooms here are infused with modern Polish charm and are budget-friendly considering the excellent location. INX Design Hotel: A brand-new boutique hotel situated on a main drag in Kazimierz. Colourful artistic designs spread throughout the property create an ambiance unlike any other hotel in Krakow. The outdoor terrace serves up spectacular views of Kazimierz and Old Town. Hotel Copernicus: Enjoy classic Central European grace at this delightful 5-star hotel just steps from Wawel Castle. The sauna and swimming pool, hidden in the Renaissance era building’s cellar, feels like a royal escape. Krakow in One Day Sightseeing Tour: A value-laden 3.5-hour guided tour that takes in all the major tourist attractions of Krakow including Cloth Hall, St. Mary’s Church, Wawel Castle, and Kazimierz. Krakow Old Town & Jewish Quarter Walking Tour: A fun-filled 3-hour walking tour covering the sites of Old Town Krakow and the Jewish Quarter of Kazimierz. Tour ends at Wawel Castle where there’s an option to continue on. Krakow City Highlights Tour: A private 3.5-hour tour through Old Town, Kazimierz, and Nowa Huta customized to your sightseeing preferences. By air: Krakow is served by John Paul II International Airport Kraków–Balice (KRK). If this is your first stop on your Poland itinerary, you can find flights to Krakow (both direct and indirect) from most major North American and European cities on airlines like LOT Polish Airlines, RyanAir, and easyJet. More options exist from Warsaw (2.5 hours away by train). Looking for cheap flights to Krakow? I’d recommend searching for airfare deals on CheapOair! By train: From Warsaw (another interesting Central European city, of course! ), you can catch a train that will zip you between central stations in about 2.5 hours. (Double check the schedule or risk getting on a slower local train!) The ticket cost for the Warsaw to Krakow train varies, but booking ahead a few weeks in advance you can find 2nd-class tickets for as low at 49zł for the faster trains. Search for Polish train fares and schedules here. Prague: From Prague to Krakow, I’d recommend hopping on a night train, unless you want to waste nearly an entire day in transit. The train leaves Prague at 23:00, arriving in Krakow at 07:00. Prices start from €29 for a couchette to €49 for a 2-bed sleeper. It’s not luxurious, but it’s a time- and money-saver! Vienna: Trains from Vienna to Krakow take about 4 hours with prices starting at about €19. Berlin: It’s about an 8-hour train ride from Berlin to Krakow. There is a night train that costs about €29. Buses are quicker and cheaper, but less comfortable. You can find fares starting at €18 for the 7 and a half hour journey. Got some spare time in Kazimierz? Visit Oskar Schindler’s Enamel Factory featuring a museum outline Krakow’s dark days under Nazi occupation. The factory is also home to the Museum of Contemporary Art in Kraków. Need a little relaxation? Plant yourself in to Planty Park, a relaxing greenspace encircling the entire Old Town where the medieval city walls once stood. Love museums? Browse through a millennium of Krakow history at Rynek Underground, a museum set in the underground vaults below Rynek Główny.